OneMinuteFit, or OMFit, is a proprietary formula of granulated cork and dry-ceramic "clay" binders that is pre-packed into your Zipfits. Dozens of formulas were tested in evolving OMFit to create a formula that combines the optimum viscosity and density to work in the extreme and most demanding environment of ski boots. Our cork compound is superior because it never compresses, deteriorates or shrivels-up the way synthetic materials, foams and fillers do. Cork yields under pressure and vibration without deforming or losing support and always returns to original memory. OMFit never hardens or catalyzes. This is one essential ingredient that makes ZipFit liners like no other you've tried. The cork in OMFit is a living fiber and does not deteriorate, even in the most extreme conditions and use. OMFit is the most resilient, supportive, protective, shock absorbing, heat exchange and insulating material ever devised for use in ski boots. The OMFit is perfected to perform within ZipFit's unique Dynamic-Response Molding System. This enables the OMFit to adapt and work with you, allowing your personal anatomy to settle into the optimum alignment and most efficient relationship with your ski boots. The OMFit adjusts constantly whether you are skiing straight, slipping gates or carving at low or high speeds. ZipFit does not cast your feet into a passive position as with factory issue and silicone- or foam-injected liners. OMFit is also organic, the best insulation and the most ergonomic environment around your lower leg and foot. In addition, it outlasts 600-700 days of hard skiing. OMFit promises you the best fitting, warmest, most comfortable, supportive and best performing ski boots you could ever imagine. Zipfit inner boots now feature a laminate of honeycombed "sticky rubber" suction cups that covers all the plastic surfaces. When the buckles are closed, the thousands of tiny honeycomb cup-suckers are pressed onto the inside of the ski boot shell. This fuses the inner boot to the shell and creates a rubber dampening effect to reduce vibration, reinforce the shell and improve foot stability. This greatly reduces the need for tight buckling because the combined support of Zipfit inner boot and the shell creates one solid unit and broadens the range of flexing adjustment, so you barely need to use the cuff buckles for adjusting flexing motion. You'll find real control using the power straps as well. TONGUE WINDOW: The tongue also has a large pressure relief window over the instep. This improves the fit and comfort for allfoot types and ski boot shells. ELASTIC TONGUE ADJUSTABILITY: The tongue is self-adjusting fore and aft by an elastic attachment system. INSTEP COMFORT: The OMFit in the tongue disperses pressure and eliminates the commonly painful instep pinching and pressure problems that are the curse inherent in virtually every ski boot liner except Zipfit. THE DORSAL ORTHOSES: The dynamic molding OMFit© tongue-window and the elimination of tongue seams over the tender and exposed instep bones, tendons, nerves and circulation, very comfortably protects and creates a personalized “dorsal orthotic” for the top of the instep and shins. The slightest gestures from the "top of the foot and shins" are transferred into powerful leverage moments for steering and edging control. In this way the slightest rolling or steering gestures of the instep and rotations of the tibial shaft is transferred with powerful leverage and authority to the skis, while also maximizing sensitivity for more immediate and decisive control. The independent support and comfort of the inner boot also means that you do not have to tighten buckles to establish support and a sense of control. Zipfit's Dorsal Orthoses also complements the effectiveness of your underfoot orthotics, improving your overall skiing experience. The ankle-heel sack shows the OMFit chambers inside a ZipFit inner boot with a curved U-shaped heel hugger (1) that tapers towards the front to give you a tight heel hold down. 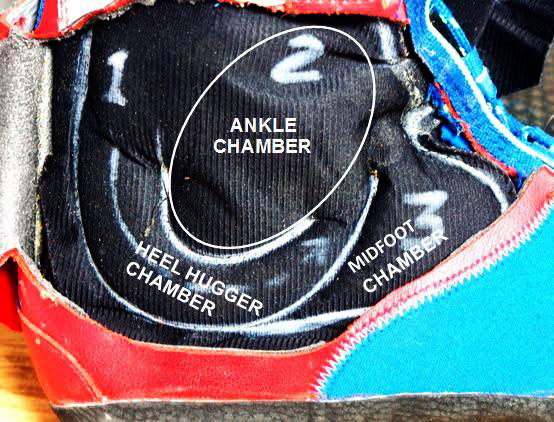 The ankle chamber (2) surrounds your ankle, providing support and dispersing pressure. The midfoot chamber (3) is packaged "empty" with the option to SpotFit inject OMFit if needed to fill space under the second buckle on the one side, and on the other side of your foot around the navicular. If needed, more OMFit cork-composite can be injected into the tongue and/or ankle-heel sacks using Zipfit’s unique SpotFit system. This need is very rare because the liners are re-primed every day when you ski. It’s important that your shells are not over-sized. The tab-sleeve pictured here at the top of the tongue (also found under the middle lace loops) of the inner boot can be pulled out for optional SpotFit injecting of OMFit. Very little is needed for best results, in order to maintain a thin tongue. The ankle heel area can also be injected from the tab-sleeves along the laces loops, but always try the tongue first.